It was Christmastime in Chicago, the year 1998, and Tereza Lee had just finished performing at a concert with her high school choir. The 15-year-old’s entire family had come to watch. As they were leaving that Friday evening, her brother darted across the street to their parked car. That’s when a passing vehicle struck him, Lee, now 34, told NBC News. Once at the hospital, where her brother was taken by ambulance, Lee’s father was thinking how to keep the family safe, she said. Her brother was a United States citizen, having been born in Chicago, but the rest of the family were undocumented. So her dad told the cops that the accident was her brother’s fault, Lee said, even though the driver of the vehicle that hit him was speeding and talking on her cellphone. Her brother was fitted with a cast up to his waist, and the Lees ended up paying thousands of dollars in hospital bills, Lee said. “That was the moment I realized that being undocumented meant more than just fear every day,” she said. The accident served as one of many reminders how Lee was resigned to live her childhood. Always present was the fear that something she said or did could send the family back to where they were born — her parents to Korea, her to Brazil. But those experiences also emboldened Lee, now a music teacher and doctoral candidate in music living in Manhattan, to share her story. Among the first to listen, she said, was Sen. Richard Durbin (D-IL). Lee inspired Durbin to introduce the Development, Relief, and Education for Alien Minors (DREAM) Act with Sen. Orrin Hatch (R-UT) in 2001, a bill to put undocumented immigrant children on a pathway to U.S. citizenship. “They call me the original dreamer,” Lee said. Despite being reintroduced and repackaged over the years, the Dream Act and similar versions of it never passed Congress. Critics argue that such a bill rewards undocumented immigrants and encourages illegal immigration. Supporters, however, say it allows undocumented children brought to the U.S. by their parents the chance to pursue an education, career, and life in America. Some 2.1 million youth or young adults would’ve been able to apply for legal status under the Dream Act, according to a 2010 report from the Migration Policy Institute. Lee was one of those kids. In the wake of the Korean War, her parents left South Korea with nothing and moved to South America for a better life, she said. Lee’s birthplace of Sao Paulo in Brazil became home to tens of thousands of men and women of Korean descent. The Lees established a successful clothing business in Brazil, but in 1985 they decided to travel on tourist visas to the U.S. where they knew people, Lee said. The victims of bank theft, Lee’s parents had nothing when they left, she said. Lee was just 2 years old. For a few months, they lived in an apartment in Brooklyn, New York, and later moved to Chicago, she said. Lee’s parents found work sewing and cleaning clothes. Her father, a Presbyterian minister, tried applying for a religious worker visa, but couldn’t get enough congregants to sign the petition, she said. “My dad was a very honest man, and he didn’t want to lie on the paperwork,” Lee said. And so began Lee’s life as an undocumented immigrant, an existence she learned about from her father when she was 6 or 7, she said. Fear followed the family wherever they went, Lee said. If they were driving and a police car passed by, her dad would order them to sit up straight. If the phone rang, no one was to pick it up. Lee said they were even afraid of their own friends. “We grew up very quiet and isolated,” she said. But there was music. It started with 7-year-old Lee poking around on a piano at her father’s church. One day a wealthy congregant visited the Lees’ home and noticed it was sparsely appointed, Lee said. In a gesture of gratitude for her father’s service as pastor, the woman bought the family thousands of dollars of furniture — and Lee an upright piano. Without a music teacher, Lee began practicing two-to-three hours a day, she said. Her father tried to help, but he also didn’t know how to play. The arrangement seemed doomed to failure. “But we figured it out,” said Lee with a laugh. While some 8-year-old girls were at home playing with dolls, Lee was busy memorizing hymns each week to perform at church services. She did take lessons for a time, but had to quit because her father couldn’t afford them, Lee said. So she taught herself until the age of 15. Lee continued honing her skills, earning a spot to play at the Christmas concert the night her brother was hit by the car. While in high school, Lee said she also took lessons at the Merit School of Music, a nonprofit that provides music education to low-income families. Lee figured she could parlay her piano playing into a paycheck to help her poverty-stricken family, she said. But she was afraid colleges wouldn’t enroll her because she was undocumented. It was at the Merit School of Music when Lee finally broke her silence about her status to the late artistic director Ann Monaco. Instead, Monaco told Durbin, the Illinois senator. 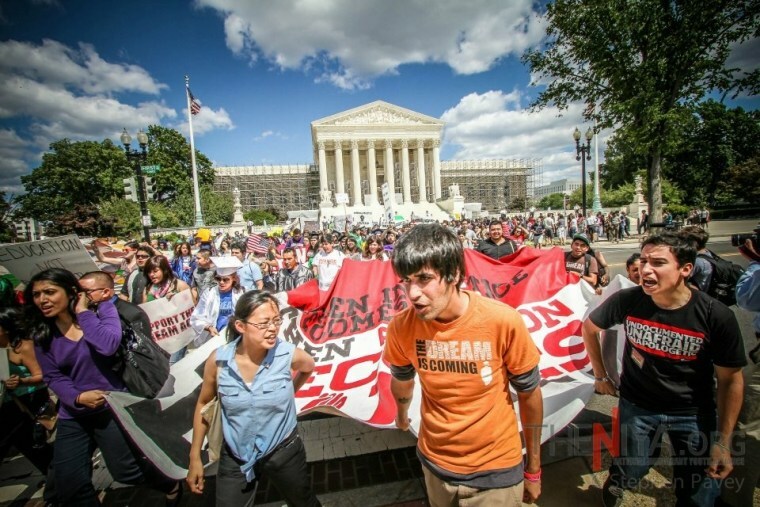 Lee’s story and others like it inspired the Dream Act, introduced in August 2001. A freshman at the Manhattan School of Music, Lee was all set to hop on a plane to testify about the bill in Washington, D.C., she said. A Senate hearing was scheduled for Sept. 12. Then came the 9/11 terrorist attacks; flights and the hearing were cancelled. More than 15 years later, the Dream Act or a version of it has yet to make it through Congress. As for Lee’s life, a lot has changed. Her father died of heart failure in 2007. She finished her master’s degree at the Manhattan School of Music and is now working on a doctorate there. She has played Steinway Hall, Lincoln Center, and Carnegie Hall. She’s also married with a 2½ -year-old boy and a 5-month-old girl. And she’s a U.S. citizen. Lee said she was able to apply for citizenship through her husband, who was born in North Carolina. The ceremony, she said, was bittersweet. It came just one day after the Dream Act failed again in Congress in December 2010. “My husband threw me a surprise party, and I cried so hard because I was holding up this little piece of paper that had so much power in my life,” she said. “It’s just a piece of paper that rules whether I had any rights,” she added. These days, Lee is still fighting for DREAMers. She’s been particularly focused on her home state of New York, where the state Assembly in February passed two pieces of legislation important to her. The first is the Liberty Act, which would make New York a “sanctuary” state. The second is the Dream Act, a bill to open up financial assistance to undocumented students who graduate from New York high schools and attend college in state. At present, state aid is available only to citizens and lawful permanent residents, as well as certain refugees, according to the bill memo. A handful of states already have similar laws on the books. New York’s bill would affect roughly 4,500 undocumented students who graduate from New York high schools each year, according to the Assembly. While the DREAM Act has passed the Assembly five times since 2013, it faces an uphill battle in the Republican-controlled state Senate. A Siena College poll published on Monday reported that 53 percent of New Yorkers support the state Dream Act while 42 percent oppose it.